I’ve been off the bike since last Wednesday, off in San Juan, Puerto Rico for work. I swear–for work. I left bikes at home and spent my time traveling the city on the bus–just 75 cents per ride!–and on foot, walking around the old city with N., eating too much mofongo and staring at the layers of a different city. There were a lot of views, of huge lizards, feminist theorists (it was NWSA, after all), blue skies, cruise ships, police officers, stray cats, forts that have been used as military installations from the 1500s to the 1950s, happy hours at all hours (this is a tourist destination, after all), and candy colored everything. There were a few bike racks, but I only saw a couple people on bikes. The streets are seriously narrow in this part of the city, but traffic moved at a crawl. You could totally share the road. But anyway–it was a lovely trip to mid-summer weather, but we returned to Baltimore’s first major cold snap. Monday it was raining, and I heeded my father’s advice to never start a ride in the rain and took the bus instead of the bike on my way down to meet my shuttle to work. The real arctic air came in today–it didn’t get over 30 degrees, and the winds were howling. So naturally I figured it was a good day to try out some of my winter riding strategies. Those mainly consist of layers, fleece tights, knee high socks, wool wherever will take it, and my windstopper fleece jacket and gloves. I slipped a wool hat under my bike helmet and was on my way. The layers worked, but oh, my face and feet were cold. I think the face will get used to the cold, or just stay cold, but those balaclava things just steam up my glasses, so it’ll just have to do. I’m in the keep-the-feet-warm research stage, but on this day, they were just cold, the wind going straight through my shoes. I stopped at the light at 32nd and Greenmount, and remembered the part where stopping is colder than going. 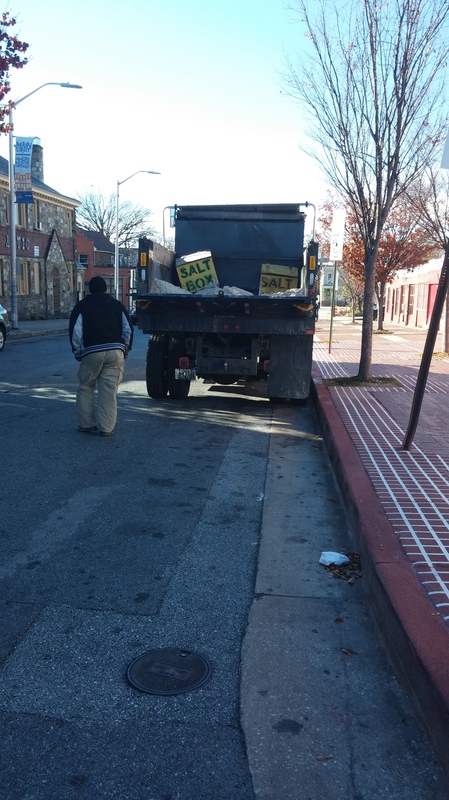 It was my turn, so I crossed and snapped a picture of this truck and its driver returning to the wheel after making another delivery of a salt box for the neighborhood. And so it begins. Regardless, though, I was happy to be on my bike, and the ride home the other way, well, it was even worse, reminding me of the part where getting hit in the face with strong freezing winds can take the internal wind right out of you. But none of that makes me want to turn in the bike for a wait at the bus stop or–gasp–a car, so I’ll call it a win. It looks like it’ll be in the 40s on Thursday, so maybe I can get a longer ride in then. This entry was posted in weather and tagged Baltimore, cold weather, personal. Bookmark the permalink. One of my mother’s maxims that always has proved true was: “If your feet are warm, you’re warm all over.” I say it to my kids and grandkids and live by it – and a few other beliefs – but it seems to work. Wind-proof shoes!